Dreaming of an Easter getaway? I know I am. When I saw these pictures of Jo Robinson's visit to Areias do Seixo in Portugal it's fair to say I was more than a little envious. Jo is an East London designer and creator of HAM - a range of delightfully fun cards, prints and homewares. Maybe you've already come across her diving bunnies and partying pigs? They put a big smile on my face. The brief seemed simple enough - a relatively close fly and flop to a remote haven with wholesome food, a thoughful aesthetic and invigorating vistas. Easy, surely? Initial research for the perfect summer hols was conducted with gusto, but as Google volleyed list after list of generic sunny retreats early excitement fizzled. We were after a design hotel with heart, one that could stick a plaster over the impact of a relentless year in the city and provide more modernist hits than you can shake a stick at. Just as I'd convinced myself that Europe wasn't going to deliver I happened across a hotel that appeared to tick every box and had the imagery and reviews to prove it. Seeming almost too good to be true, we booked and three months later arrived at the front door of Areias do Seixo with big expectations. 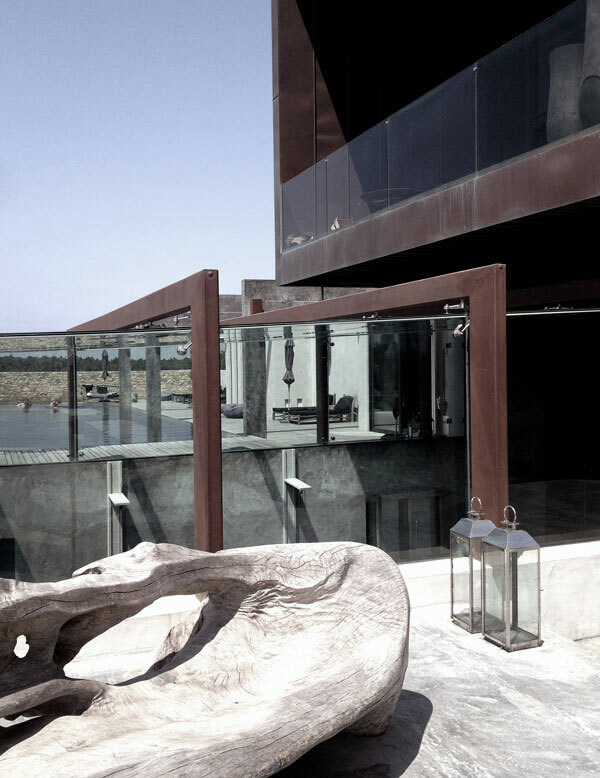 Labelled an 'eco hotel', Areias do Seixo is pinned to the rugged Portugese coast an hour north of Lisbon. Its emphasis is on experience, using nature in all its guises to help the residents feel utterly relaxed and revitalised. The building and its surroundings are themselves a visual detox for the senses - the brainchild of architects Eduardo Souto de Moura and Alvaro Siza. Its elegant concrete beams and enormous panes of glass slot neatly into the hillside, reflecting and imitating the natural landscape. This is inside out at its best. Of the fourteen individually designed rooms we picked the 'Gold Suite' - a vast cool space with minimalist sentiments and a dusting of Moroccan references. 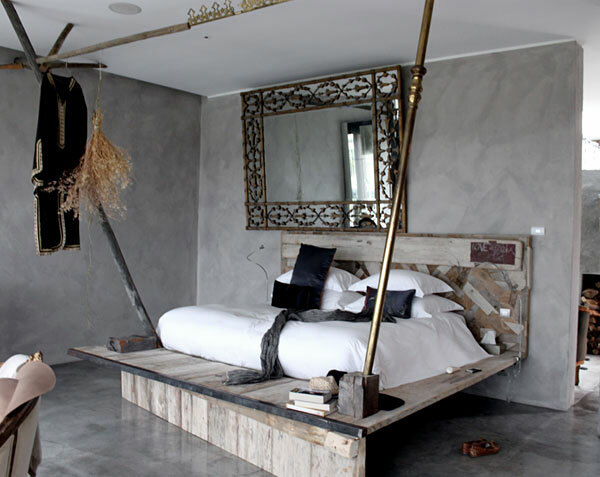 Sculpted concrete sat comfortably alongside a driftwood four poster, gnarled wood screens, vintage light fittings and pebbles from the local beach. All warmed with a hint of gold and glowing candles - not a TV in sight. The bathroom itself was a tantalising design statement with an outdoor sunken tub and two rainforest showers framed by a glass roof. Thoughtful extras such as fresh organic pears from the hotel's garden, a pillow menu (yes a pillow menu!) and a gentle soundtrack trickling out of hidden speakers, which you could of course change to suit your mood, soon had us settled into the absolute definition of modern luxury. Venturing back to the main body of the hotel we found a carefully considered, gallery like space. 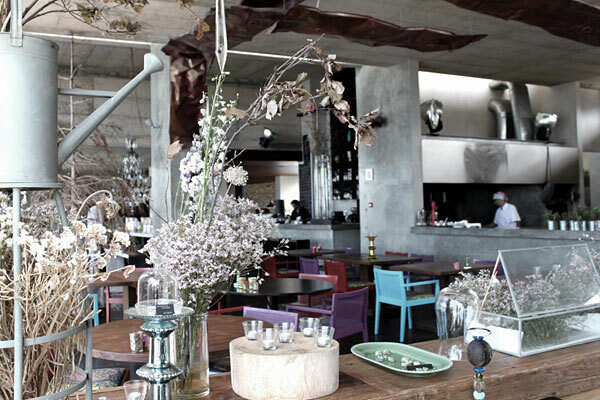 Industrial lighting, suspended pod wood burners and sculptures from reclaimed material could be found at every turn. Rest areas blended into places to eat, the open kitchen at its heart, which led to an enticing display of the owners' favourite objects and foods, all of which could be purchased as a little memento to take home. Outside we skirted round the infinity pool and took the path lined with lavendar and olive trees to the hotel's deserted private beach. The sand dunes that had interrupted a clear view of the sea from our room were soon scaled to reveal a jaw dropping sunset and the euphoric sound of the Atlantic waves crashing against the rocks. We sat, we took deep breaths and overawed by nature itself... we felt relaxed.... exactly as promised. Jo's range of cards, prints and homewares are available online at www.hammade.com and at stockists including The Design Museum Shop and Daylesford Organic.